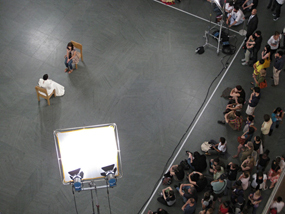 “[…] When Marina Abramović sat for hours at a time in the central gallery of MoMA, bright lights beaming down on her as she met visitor after visitor with her steady gaze, what shook the audience was her commitment. The act of willfully placing oneself on a rigorous schedule best suited to an endurance sport, sitting passively and doing nothing but staring, struck the audience as touching upon the two poles of the elegiac and nihilistic. The artful meaning of looking into the artist’s eyes was eclipsed by the pure physicality of it all — how could she possibly sit there every day?